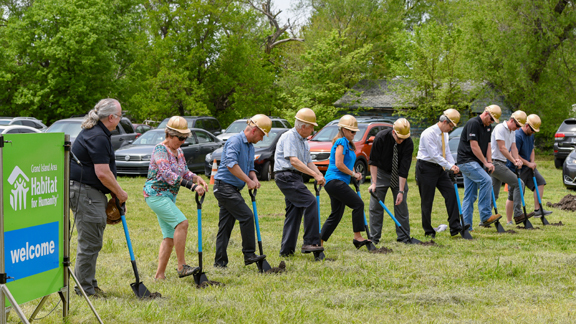 On May 22, Grand Island Area Habitat for Humanity (GIAHFH) held a ceremonial groundbreaking at the site of its Capital Area Development, located adjacent to 1027 E. Capital Avenue. The new development will allow Habitat to build 22 additional homes over the next four to five years. Habitat also announced the kickoff of its capital campaign, “Empowering People, Developing Community,” to raise funds for infrastructure in the development as well as an associated operating endowment. The goal of the fundraising effort, led by Campaign Chairs Charla Miller, Steve Anderson and Sara and Steve Arnett, and Honorary Chair and GIAHFH Founder Roger Nelson, is $750,000. PJS is providing counsel for the campaign. Dana Jelinek, Executive Director of GIAHFH, explained that the scarcity of affordable lots for Habitat’s home-building program is what prompted the purchase of the 3.5-acre parcel of land in 2015. Before home construction can begin in the new development, GIAHFH needs to add water, sewer, and electrical lines, as well as streets. Although Habitat homebuyers repay the organization the cost to build homes at 0% interest, they still must meet low-income guidelines and debt-to-income ratios. Because of this, development costs cannot be passed along and still have homes remain affordable. While Habitat does have money set aside to help with development costs, it would deplete reserves and delay construction of future homes. For this reason, the capital campaign has been established to raise the necessary funds. To donate to the “Empowering People, Developing Community” capital campaign, or to learn more, visit online at www.gihabitat.org.